Slow food? Slow travel? Slow Italy? I'll take Umbria! 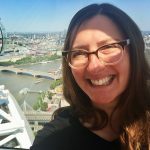 There are so many ways to enjoy Italy, and our Untour offerings there are an embarrassment of riches: major cities, gorgeous countryside, placid mountains, and dramatic seaside. You could run around for months and not see it all. But if you are looking for a more laid back, off-road experience, consider Umbria. Umbria is Italy’s green heart, a vital center of the country’s olive oil production, a hotbed of truffles, home to some of the country’s best butchers, and Italy’s lentil capital. Take time to indulge in the local specialties and to appreciate their places of origin. From the locally fished trout of the Clitunno to the roadside porchetta trucks selling pork sandwiches, Umbria is a gastronomic wonderland with something for everyone. So much grows in these hills. Truffle preserves skirt the town of Spoleto, and in season, you will find local truffles on most restaurant menus. The prices in those restaurants tend to be lower than in neighboring Tuscany, and much lower than similar places in the resort areas. Venture into the Valnerina (Nera Valley) for some of the region’s most striking scenery. The butchers of Norcia are renowned in Italy. Some of the country’s best sausages, cured meats, and hams come from this lush corner of Umbria, where the livestock have been well fed and pastured, and wild boar figures prominently. 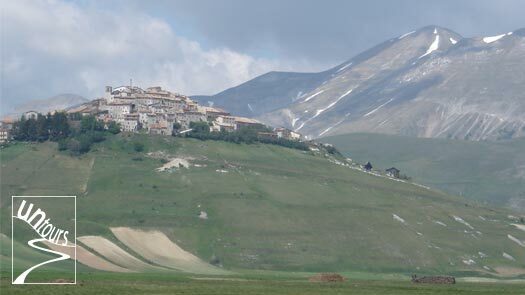 Continue on to bucolic Castelluccio, set high in the Apennines, overlooking the Piano Grande. The finest lentils and grains grow in the surrounding fields. Much of what is grown here is biologico (organic). Spelt figures heavily into the local diet and is a favorite in salads and soups. Enjoy a hearty local lunch before heading off to hike. Learn a new alphabet: Discover DOP (Denominazione di Origine Protetta), Protected Designation of Origin, the Italian way of indicating and protecting the origin of its many micro-regional food products. IGP, Indicazione Geografica Protetta, is a similar, though less strict designation. Look for these letters on your journey. Sample DOP olive oils from nearby producers and buy direct from the source. Untours’ apartments in Umbria all intersect with local farming and food production. Our Ettore apartments are on an organic, biodynamic farm, where you can buy fragrant olive oil from your friendly host. I’ll take his spelt cakes over rice cakes any day. The Sara, Alessandra and Maria apartments are on a farm where olives grow on a steep incline, producing different flavor notes at different altitudes. Your hosts there will gladly explain it all, and proudly show you their antique olive press. Speaking of beautiful, productive farms with warm, gracious hosts, why not just kick back on your farm for an afternoon? The local agriculture is as integral to the region’s history as its many castles, Etruscan tombs and hill towns are. If you want to get a little vacation out of your vacation, consider relaxing and drinking in Umbria’s quiet beauty from the grounds of your farm. The landscape inspires contemplation. The Tigli and Girasole are among many apartments on the scenic plain between Trevi and Spoleto. Lounge by the pool in the summer. Or borrow the farm bikes and pedal to a grain mill on the grounds, or into a small nearby village for lunch. Umbria’s countryside is more mountainous than neighboring Tuscany, a rugged terrain, more densely wooded and wild. There are countless hilltowns to explore, though you may prefer the view of Trevi from a lounge chair on your farm. There are plenty of towns within easy day trip distance: Perugia, Assisi, Orvieto, Todi, Gubbio, and more. Familiar names on any good itinerary, an easy two weeks’ worth of day trips to enjoy. But you might prefer to spend the day milling around little Deruta, lingering in the ceramic artists’ studios and shops, majolica spotting in the colorful residential side streets, and tucking into a cozy trattoria for a hearty country lunch. Or visiting Montefalco and sampling the rich local red wines from their cellars: Rosso di Montefalco or Sagrantino. Or exploring the ancient Roman baths of Bevagna; a proud local will gladly show you the town’s elegant theater too. Where is Bevagna? Exactly. Umbria is perhaps the least touristy of our Italian Untours. Though we love all of our Italian destinations, each for very different reasons, this is the one that has the fewest tourists. Spoleto, the closest major town, has it all, with an annual music festival that brings visitors from around the world and endows it with a quiet sophistication. Check the Alexander Calder sculpture at the train station, as at home here as the ancient Roman amphitheater on the edge of town. The menus in Spoleto’s many fine restaurants are almost always available in English, though your server may not speak a word. Even here, the Umbrian warmth and patience comes through. Your waiter is more concerned you eat well than worry about language gaffes. So relax. Take your time. You are among friends here.